Team Nancy Zieman is always on the lookout for new tips such as treating a bee sting or prompting a cactus to bloom. When it comes to sewing & quilting tips, the interest level rises to new heights. Over the years we’ve gathered and discovered unconventional tips to use in the sewing room. Some hints were sent in by viewers, others given by Sewing With Nancy co-workers. Regardless of the source, we are sharing many maverick-type hints with you in today’s program. Household items such as drawer liners, pipe cleaners, leftover change, a permanent marking pen, and pedicure supplies all have a purpose when sewing or quilting. Curious? Join Nancy Zieman for this episode of Sewing With Nancy: Renegade Sewing & Quilting Tips. While quite a few tips are covered on the show, there are even more in the book, 101 Renegade Sewing & Quilting Tips, available at Nancy’s Notions. Learn how to repurpose saucers and ramekins to create a magnetic pin cushion. It looks attractive and keeps all your pins in one place. Need a thread stand? There’s a trick for that, too. Are you packing for a retreat, workshop, class, or Sewing Weekend, but not taking your entire bobbin box? Don’t worry, you can pack the bobbins you need after your next pedicure. Does your sewing machine need a little cleaning from time-to-time? Make these handy scrub brushes from items you already own. We’ll also show how easy it is to use shelf and drawer liners to create a no-slip surface for your sewing machine’s pedal. This cut square of textured foam will help keep the pedal in place as you stitch. There are so many tips to make sewing easier and smoother. Watch the new episode of Sewing With Nancy, today, for these and many more time-saving ideas. Next, use nontraditional items when quilting. Magnets, a white eraser, an empty mint container, and grapefruit spoon all have staring roles as we make quilting easier with these Renegade Tips. Use a magnet to easily change your rotary cutting blades and protect your fingers. Also, continue to use the blades marked “P” for paper crafting projects. It may not be sharp enough for crisp fabric cuts, but it still has some life in it. You’ll have to tune in to Renegade Sewing and Quilting Tips to see how painter’s tape will yield precise cuts and to watch how steel wool can sharpen your hand sewing needles. And, who knew that grapefruit spoons were fantastic accessories to assist in safety pin basting your next quilt project? Do you have any pressing issues? A night light, a remnant of netting, cardboard from a cereal box, and an outdated magazine may be a solution to one of your dilemmas. If you happen to appliqué, hem, or tack with fusible web, there’s a chance it may get on your iron. Not too worry! Netting is a great resource for cleaning fusible adhesive off the iron’s surface. Press seams flat no matter where they may fall on your quilt or garment. Learn how to use magazines and wool felt to create a tailor’s pressing sleeve roll in a snap. When it comes to cutting out patterns, there are several renegade approaches to incorporate. Washers from the hardware store, painter’s tape, frosted tape, and a picnic cloth can come in handy. Pool noodles, a soap dispenser, a school pocket folder, popsicle sticks, and a recycled picture frame are on the list as ways to organize. Our hope is that you’re curious to see how and why these nontraditional items made the renegade list. Make sewing trouble-free with 101 unconventional hacks. Known for breaking sewing and quilting rules, Nancy shows you how to use household items to save time and money in your sewing room, plus novel ways to organize sewing and quilting supplies. Did you realize there are handy devices all around the house that can help streamline your sewing and get great results? Whether you are an accomplished seamstress or a beginner sewer, you’ll find oodles of ingenious and practical tips in this book and DVD combo. The book has organized tips by task area—pattern cutting, pressing, sewing, and more; plus the tips are numbered so you can easily make note of ones you’d like to revisit. The companion DVD highlights over two dozen tips and hints. Simplify the steps to cutting out patterns using commonplace items, like washers from the hardware store, and painter’s tape. Learn how ordinary household items such as pipe cleaners, spare change, and a pedicure supplies have alternative uses for sewing. Eliminate pressing dilemmas with a night light, a remnant of netting, cardboard from a cereal box, and an outdated magazine. Enlist nontraditional items—magnets, a grapefruit spoon, and a pool noodle—to make quilting tasks go more easily and quickly. Organize your sewing room and keep important sewing notions in easy reach with unconventional items, like wooden craft sticks and drinking straws. Watch Renegade Sewing & Quilting Tips on Sewing With Nancy online. For a chance to win a copy of the new book, 101 Renegade Sewing & Quilting Tips, from Nancy’s Notions, leave a comment sharing your favorite sewing or quilting time-saving tip. The randomly selected winner of a copy of the new book, Precut Fabrics for Speedy Projects from Nancy’s Notions is Margaret. I found a toolbox on wheels with two sections in a department store. It greatly reduced the number of trips I made to my car to bring in everything I need for classes. I can also put my sewing machine on top & wheel them in together. I like the idea of using the steel wool in a cushion for the needles. I’ve been a fan of Nancy since she came to pbs. I was so glad to see her work and tireless energy to teach the public is being carried on. One of my best tricks to keeping my sewing/quilting room neater is to cut my scraps into squares after a project is done. I was given some rectangular cookie tins a few years back, and I’ve labeled them for 2.5, 3, 4, and 5 inch squares. When my project is done, I take a few minutes to cut anything smaller than 1/4 yard pieces into squares and stack them in the tins by color. Recently I was teaching my granddaughters how to sew, and their project around Christmas was to make something. Each one chose squares and made a pillow. Even though they’re identical twins, their projects were amazingly different. Those tins of blocks were just the inspiration they needed. The book of tips and hints sounds amazing. Thanks for the opportunity to get one. I save the rolls from wrapping paper and roll all my interfacing and embroidery stablizers on them. I fasten then ends with pins. This way, no fold marks! And they take little room. The type can be written on the end for the rolls and the directions go inside. boxes without searching through many boxes. this works when you have lots of fabric. I would absolutely love to have Nancy’s book. Miss her, but glad the shows live on. I use a wooden shish kabob stick to guide my fabric under the sewing machine needle as i sew and to protect my own fingers. You can buy a whole bag of them at a dollar store and cut into any length you want. Less expensive than the plastic Purple Thing and won’t hurt your machine needle if it hits it. I would love to win the book, I love tips and anything Nancy Zieman! love the ideas given & the ideas in ‘comments’ section – am always on the look out for recycling used items that others would put in the garbage! I had not seen the one on storing ribbons, etc in the basket on a wooden dowel. I buy a lot of plastic storage containers, but only get the transparent ones so I can easily see what is inside to include colors. I have been labeling fabric size on each piece when I bring home and change it if I use some for a project. It is so much easier to see what you have. 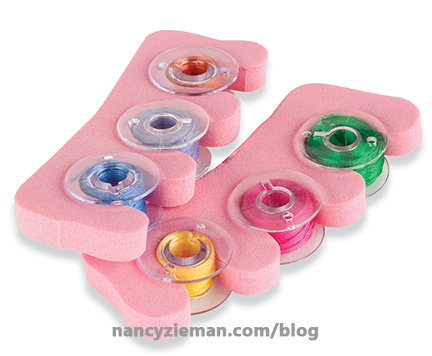 I loved the hint to use the foam pedicure toe separator for bobbin storage. Since I have a lot of thread, I’ve sorted it by colors into the colored drawers of a craft storage unit. It could also be used for storing fabric scraps by color. I’m in the process of sorting my buttons by colors into canning jars. I loved the bobbin and ribbon storage ideas. I like to repurpose mint and gum containers for storing needles and thread while traveling with projects. They, along with free cigar boxes can also be used for button storage as well as other items to help organize your sewing space. So many good ideas! This book is one I need to have. I love the magnetic washer idea. Great ideas! I can hardly wait to actually utilize some of them to help me organize my sewing area!! I bought the plastic shoe boxes w/lids for my scraps. Each one is color coded, so when I want a certain color I can find them easily. Not only that you see threw them and I can find color when I want it. Also they stack together. I love the washer pattern weights! It’s much faster than pinning! I use, headbands when rolling up half done quilts, makes less ironing then folding. And when i machine quilt. Fons and Porter glue sticks are my favorite for holding things without the bulge that pins make. This works on zippers, matching seams on quilts, holding boy and girls patches in place while I sew them, and many other mending jobs. I taped a 2-inch long pen cap to the bottom right front of my sewing machine, and keep my tiny scissors in it, to save space and keep them handy. I can’t wait to see more of Nancy’s tips. I keep a small box with a lid on the sewing table and mark it as ‘trash’. This is where I dispose of all my bent or broken pins and needles, as well as razor blades or anything that might poke me if dropped in the trash can. When it is full, I tape it shut and put it in the trash. I love Nancy’s hints and would be thrilled to get her book. At close out picked up heavy round colored glass candle holders 2″ circumference, half inch thick for pattern weights. Pretty, going strong after 10 years use and work great. I use magnetic bowls from the auto parts store for my pins. Stronger magnet and less expensive than one from a sewing store. I love being organized & this book has many ideas I have not thought of before. I have a large walk in closet to store my stash & on the long wall I have hung up all my quilting tools so every time I need a special tool there is no more hunting. I put a lock through my sewing scissors handles so no one in my home mistakenly uses them. I have been sewing clothes for myself and family since I was a teenager learning on a treadle sewing machine. I would like ideas to enjoy sewing more. Thanks for the ideas and help through the years. I had some old cloth vertical blinds that I had my husband take down, but I removed the rectangular weights at the bottom and I use them for fabric weights . I also like to use toothbrush holders for scissors, pens, and other things. They are small and I have at least one my each of my machines. Love Nancy’s ideas and would love to win this book . I use a recycled plastic make up tray that my daughter threw out. I put my most used embroidery threads in it for easy access. I use magnetic bowls from the hardware store to hold my safety pins. I put my used rotary blades in a jar with a lid so no one can get accidentally cut with them. I use a zip lock bag to place my binding in, hang it near my machine and as I sew it feeds right out of the bag. No more wrapping around my feet or chair. When piecing a quilt, I like to wind several bobbins & place them on my extra thread stand on my machine. I also keep my ironing board in a different room. It makes me have to get up and move. Otherwise, I would just sit and sew for many hours without ever getting up. With more organization of supplies at the beginning and writing out a plan of action allows me to accomplish more. This is true with both short and longer working times. I use a day of the week pill case (7 compartments) to store bobbins. Two fit in each “day” and the lids keep the bobbins secure and clean. Before I store a new piece of yardage, or the remainder of yardage used for a project , I pin a label noting the # of inches or yards for the piece. When I go to my stash, I know by looking if there is enough of a piece for my new project. I use a dental mirror to “look” for the holes to put the needles in on my serger. You just have to get good at moving the needles the reverse of what you think. . I try to keep my work area clean and organized. I find that if everything is put away in the right place it is easier to get a project started, going and finished because I don’t have to hunt for my tools. I really like new ideas, so I think this book would be wonderful. Even the ideas in the article are great. Thank you for this opportunity. My sewing room really needs help. I don’t have a tip. That’s why I would love to have Nancy’s Renegade Sewing and Quilting Tips. It would get a lot of use! I would love to see the book, so many ideas would be useful for me as I once again try and organize my sewing space! I too would love to WIN the book. I have a sewing room but I’ve outgrown it. So maybe the book would have some ideas on how I could better organize it. I save the cut down boxes from the grocery store. When I’m working on a project and have to stop before it’s finished, I just put all the parts – including pattern pieces, fabric, thread, etc. – in the box and I can keep them together and handy for when I get back to the project. Put a drop of sewing machine oil on the end of a cotton swab and use it to clean all around inside your bobbin area. The oil helps pick up tiny specks of lint and you’re oiling your machine at the same time. I like using things I’ve found in the hardware store, such as a box used for storing electronic screws, etc. I use to organize my embroidery thread. One of my best time-saving tips is to do all the sewing or serging that needs to be done with a certain color thread at the same time. I have lots of projects (new and repairs or recycles) that are laying around the room. If I do everything that I can and want with white thread in the serger, then I save repeated thread changing time which can really add up! My hint would be to use a golf tee to keep a bobbin with the spool of thread. So many good ideas. Would love a copy of this book. I use Lipton tea bag boxes for several different organization tips. I’ve used decorative duct tape to cover them. Keep the little trays inside to separate different color buttons, short pieces of ribbon, etc. I also use them without the little trays to keep stamps, small pieces of Heat-n-Bond, fusible interfacing, etc. To keep my smaller rotary cutters, marking pencils/pens, tweezers, paint brushes and the like, I have put duct tape around an empty cigarette carton with the top edges of empty packs also wrapped and placed back inside for dividers (I know I should quit smoking). Would love to win this book! I purchased 3/4″ flexible clear plastic tubing. Sliced it into pieces narrow enough to fit inside my bobbins. I split the circle and placed it over each bobbin. No more chasing that little bobbin across the floor when it is dropped. Last time I dropped my box of bobbins, it was not the disaster it used to be. Excellent idea to use the plastic tubing. I know about the chasing the bobbins all over the place. What clever time saving tips! My ribbon drawer could definitely use a makeover. To save time, I try to do as little pinning for my pattern pieces as possible. I have weighed the pattern down with things I can grab that are in my vicinity, using cute washers would be much more fun! I sew at the kitchen table and over time discovered the items I was having to go and get in my dresser drawers in a bedroom. I bought a small 3 drawer plastic container that holds all of the items most used right next to the sewing machine and yet it does not take up much space. I really love it and would recommend it to anyone who needs storage for the small items we use like the brushes to clean our machine or the extra sewing machine needles. Thank you for the opportunity to win this great prize! It’s amazing how many things can be used to repurpose for the sewing room. I use the marked tomato pin cushion for needles. The magnet idea to change rotary blades will save a lot of cut fingers! I would love this book! Love all of Nancy’s tips over the years. I keep a piece of fabric with all the new needles I use marked with their sizes next to my machine. The “missing” needle is the one in the machine. All the used ones go in the marked tomato cushion. I collect old metal lap trays. I hang them on my peg board walls and use as magnet boards. A twofer. I get to see my beautiful trays and they hold so many papers and notes that I reference often. I do believe that my favorite tip was the one about using the magnet to change your rotary cutting blade. No matter how careful I am, I always seem to nick the edge of my finger when changing the blade. I have a separate rotary cutter that I use for cutting stabilizer and paper, different brand than my quilting rotary cutter or the blade idea would be great. One hint that I didn’t see that works great for me is to use a small artist paintbrush to clean around in my sewing machine, long and skinny and can get in those little tiny spots around the bobbin case. We can always use more hints on ways to do things in our sewing room, so this book would be awesome. I have made a design wall from an 8′ by 4′ piece of foam-like board used for insulating I purchased at Lowes. I had a guy at the store cut it in half so I could get it home in my car, and covered both pieces in tan flannel that is a close match to my wall paint. I used gorilla tape to adhere the fabric and then hung them with command hooks. Didn’t damage the wall and it works great! I use an block of scrap wood to set my seams after I press them. always on the watch for ways to make things easier. having things at home to work with saves me trips to the store. You have some amazing ideas. Thank you for these ideas. My best time saving tip is probably to cut out my blocks some time before I am ready to sew them , so I am ready to piece when I have the time. I’m new to quilting. I’ve been sewing since high school off and on. I love the ideas and Nancy shared in her video. I have used the idea of labeling scissors and cutting blades for paper or fabric. Baby lock and Nancy have given me some great ideas for projects. I will be teaching a Kids Summer Camp for sewing and look forward to using her books for teaching them to sew and have fun with sewing. I’ve used washers for pattern weights for years; a gift from a sewing friend. I love the pedicure sponge for bobbins. I never would have thought of that. And, I hate that they are a mess in my drawer. This book would be great to add to my sewing library! Because of watching the show, I have used the pipe stem cleaner to clean my bobbin area but forgot about using the straw as a handle. I’m curious to see the other hints in the book so I hope I’m the lucky one this time! Love the idea of ribbon and trim wrapped around sticks. Right now they are just loosely stashed in a glass jar for color and inspiration. I would certainly love some more ideas. I get the acid-free storage boxes approx. size 15″ square X 3″ deep. I use these to keep my finished quilt squares together for a project, also to keep class supplies together for a project, UFO containers with each UFO in its own box. For larger projects I get the somewhat larger containers or to store fabrics for a particular project. I have lots of UFO containers, but at least the projects are separated & ready to finish one day. I use a lint roller on my clothes before I leave my sewing room, so I don’t leave threads all over my home. Roll the lint roller on the floor around my sewing machine helps to keep my floor cleaner. To help keep my sewing room tidy, I use open boxes, small cans or cloth baskets purchased from the Dollar Store, Target or after the holidays to hold my sewing supplies. They are great for embroidery scissors, another for pens, pencils and rulers, sewing scissors, marking pens, etc. Plus, it adds a touch of color and whimsy to my room. I’ll use the ribbon storage idea very soon. I love the idea for storing ribbon. Keeps it nice and neat but still very handy. I am amazed at all the things you can do with painter tape. Thank you for this new idea about marking my cutting ruler. I also love the tray table ironing board idea. It will be very helpful for my paper piecing quilt projects. I have used a mini “Pound Puppy” for years as a pin cushion. Brings smiles to my sewing friends. Use a sharpie pen to mark each section of a “tomato” pin cushion with sewing machine needle sizes to keep track of the different sizes when switching needles for projects. I love these tips. One I can suggest is to use a Command metal hook (3M) and adhere it to your sewing machine. Then hang a small pair of scissors on it for handy use to clip threads, etc. I love a tidy work area, so tips to be better organized are always welcome. I love the idea of labeling blades for rotary cutters. I use one for zippers, because I use a lot of bags, and I have kept it in a separate place, but the simplicity of using a Z to mark it is fabulous!! I love my ruler with holes for the needle so I can get the right seam allowance using mole skin as a fabric guide, and I cannot sew without my sticky roller to pick up stray threads and lint. I love my seam roller to press tiny doll clothing seams open I don`t have to use the iron a few rolls with this great notion I bought at Nacny`s works wonders WHY didn`t I have this years ago? One of the best tips I ever got was licking the needle hole to make threading the needle a breeze. Works on machine needles as well as hand sewing needles. A lot of good ideas. I have my bobbins in my pedicure roll, got washers from my husband tools and so many other things to use to store things. These are really good tips. Going to share this on Facebook! You just know that Nancy had another collection of hints to make our precious sewing minutes more productive! How I would love to add this book to my library of her beautiful projects and techniques! I always stay tuned!! Who can’t use suggestions to help in sewing room? There is never enough time to sew so why not make it easier. I do lots of quilting, so to save time, I line up my patches and sew them one after the other, without stopping in between. When you get a whole row or all of one block done, then take it off the sewing machine and cut threads between each block and press. Easy and fast! I use pony tail holders from the Dollar store to secure thread ends of all my machine embroidery thread. I have a old hair roller with a Velcro I should surface that picks up all the loose threads efficiently. I am kind of new to sewing and try to follow directions so these tips will very much come in handy until I figure out my own shortcuts. Thank you so much! Awesome tips! I love the ribbon storage. Right now my ribbon is jumbled in a drawer. Great ideas! Thanks. I love my quarter inch foot! And my scant quarter inch foot! I always mark a seam allowance guide on my sewing machine with washi tape. It helps me sew faster.